Alumnus José Antonio Guerrero Ortiz is the CEO and Founder of a new international classical guitar magazine, Memoirs Classical Guitar Magazine, in contact with many international artists from around the world. After graduating with a Master of Music degree from Texas State, he continued his musical studies while living in Izmir, Turkey for two years. He returned to the United States and lives in San Antonio, Texas. This entry was posted in alumni students faculty NEWS on April 30, 2018 by Thomas S. Clark. The Texas State Student Chapter of the American String Teachers Association (ASTA) was awarded the 2018 Most Improved Student Chapter Award at the 2018 National ASTA Conference in Atlanta, GA. The criteria for being selected include demonstrating growth in chapter membership and establishing a commitment to promoting strings at our university and in the greater community through organizational activities. There are approximately 70 collegiate ASTA chapters across the United States. 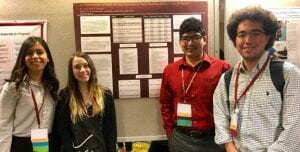 This year 13 of our 28 members traveled to the National ASTA Conference. In addition to being present to accept their award, five students served as demonstration group for a session presented by Dr. Lynn Ledbetter, and four students presented their research study titled “ An Examination of Note Writing Activities on Note Reading Ability in Suzuki Based Ensemble Classes.“ The Texas State Student ASTA Chapter Faculty advisor is Dr. Rebecca Tast. Dr. Rebecca Tast was invited to serve as a clinician for the 2018 National Orchestra Festival, which took place March 7-10 in Atlanta, GA. During this event, Dr. Tast provided educational clinics to some of the top middle-school and high-school string orchestras in the nation. This is an annual event supported by the American String Teachers Association. This entry was posted in alumni students faculty NEWS and tagged National Orchestra Festival on April 30, 2018 by Thomas S. Clark. The Texas State University Trombone Choir under the direction of Dr. Martin McCain recently performed the national anthem at a Round Rock Express game at the Dell Diamond on April 19th. This entry was posted in alumni students faculty NEWS and tagged Dell Diamond, Round Rock Express, trombone choir on April 25, 2018 by Thomas S. Clark. School of Music jazz faculty Hank Hehmsoth and Utah Hamrick were featured performers with Bob Reynolds (saxophonist with Snarky Puppy) at the Fredericksburg Jazz Festival, Saturday, April 21. The festival producer, Jason Younts, is a TXST Master of Music graduate and former student of both Hehmsoth and Hamrick. This entry was posted in alumni students faculty NEWS on April 24, 2018 by Thomas S. Clark. 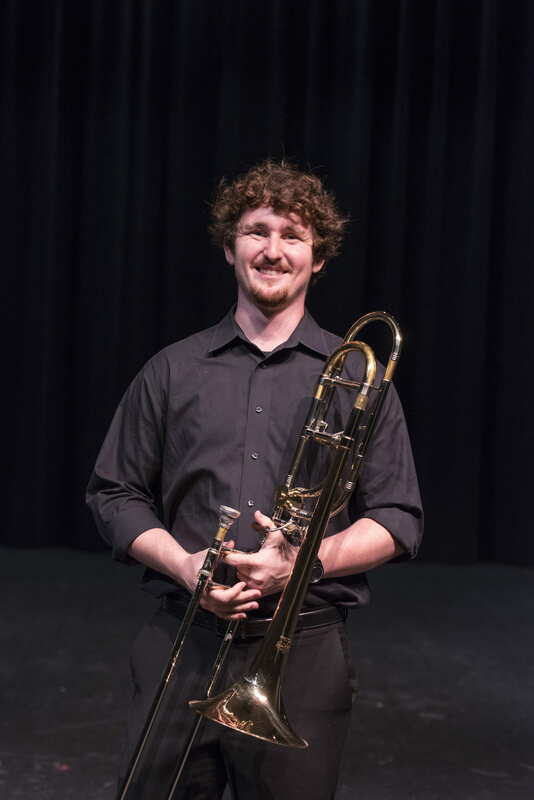 Trombone alumnus Camden Scarborough (BM ’17) has recently won a position as an associate member of the Civic Orchestra of Chicago. He will begin his post in August. 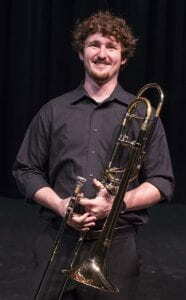 Camden is a first-year MM Performance student at Northwestern University. This entry was posted in alumni students faculty NEWS on April 19, 2018 by Thomas S. Clark. Dr. Martin McCain was a guest soloist with the Balcones Community Orchestra on March 25, performing his bass trombone arrangement of Carl Maria von Weber’s Romance with orchestra in addition to Anthony Plog’s Nocturne for Bass Trombone and Strings. McCain’s Weber arrangement and Rachmaninov’s Vocalise arrangement have also received international distribution through the Martin Schmid Blechbläsernoten publishing company in Germany. In Memphis, Tennessee he performed with the PRIZM Chamber Orchestra in an MLK50 concert that was broadcast on live TV. The concert was a part of a week-long celebration in commemoration of the 50th anniversary assassination of Martin Luther King, Jr. McCain also hosted his former student Kevin Dugat (BM ’13) who gave a lecture topic on “A Guide to Freelancing: The Tangibles and Intangibles to Succeeding in Our Musically Competitive Environment”. Several trombone students have been accepted into the Southeast Trombone Symposium at Columbus State University. Matthew Acosta, Fabian Reyes, and Alex Flores will have the opportunity to study with all of the members of the New York Philharmonic low brass section in addition to members of the Boston Symphony, Pittsburgh Symphony and Atlanta Symphony this coming June. Several trombone alumni were also accepted: Michael Martinez (MM ’17), Camden Scarborough (BM ’17), Matthew Flores (BM ’17), Michael Johnson (MM ’17) and Jett Walker (BM ’13). These alums are currently pursuing their MM and DMA degrees at the Eastman School of Music, Northwestern University, Ithaca College and the University of Alabama. Richard Hall was sound editor, sound designer, and music composer for the short video-dance film, “THE WALL” which was chosen to be screened in the very first “Dance on Film” component of Austin Dance Festival 2018. The film was produced, filmed and edited by Texas State University Associate Dance Professor Ana Baer, conceived and and directed by Texas State University Director of Dance Michelle Nance and Baer and featured dancer Nance. “THE WALL” has been previously shown at the Miami Epic Film Festival, the Cine Club Sandwich Film Festival in Puebla, Mexico, and the AM Egypt Film Festival in Cairo, Egypt. This entry was posted in alumni students faculty NEWS on April 11, 2018 by Thomas S. Clark. Todd Oxford has been selected for The Fulbright Specialist Artists Roster, a program of the U.S. Department of State Bureau of Educational and Cultural Affairs and World Learning. This entry was posted in alumni students faculty NEWS and tagged Fulbright Specialist on April 11, 2018 by Thomas S. Clark.